Make this Greek Style Bolognese Pasta and enjoy a flavorsome home cooked meal today. Add grated kaseri or parmesan and enjoy the pasta while still hot. Greeks and Italians love their pasta and this Greek-style Bolognese pasta is the proof. Every home cook in Greece makes their own version of this tomato and meat pasta, called makaronia me kima. It’s a truly versatile recipe that can be easily elevated with a variety of spices. If you like this recipe for makaronia me kima, you can now pre-order “My Greek Salad – The Cookbook” for 100 more authentic recipes that bring an authentic Greek feast right in your kitchen! This traditional Greek recipe is called “makaronia me kima” and is the definition of comfort food. The sauce is thicker than its original Italian counterpart. You can even make it as a filling for tacos, chili and meat stews. You only need 10 minutes to prep and then the sauce cooks itself. This is the beauty of this recipe, simple and full of flavors and aromas. Try this recipe for makaronia me kima and you will love it. Make this Greek Style Bolognese Pasta and enjoy a flavorsome home cooked meal today. Add grated kaseri or parmesan and enjoy the makaronia me kima while still hot. Put a large saucepan on a medium heat and add 1 tbsp olive oil. Add the onion, garlic and fry for 5 minutes. Stir the veg often until it softens. Add the canned tomatoes with salt, fresh pepper and brown sugar. Stir with a wooden spoon, breaking up the tomatoes. Bring to the boil over medium heat and let simmer for 10 minutes. Increase the heat to medium-high, add the mince and cook stirring for 5 minutes until the meat is browned all over. 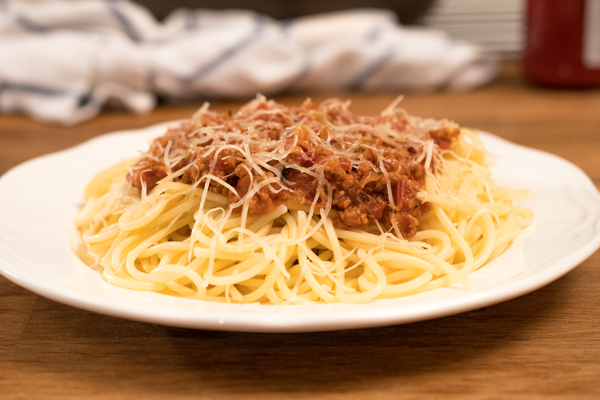 The Bolognese sauce is ready when you have a rich, thick sauce. When the Bolognese is nearly finished, boil the spaghetti following pack instructions. Drain the spaghetti and stir into the Bolognese sauce. Serve the makaronia me kima with grated kaseri cheese.